Hey, there’s nothing wrong with taking a day to celebrate a fun treat—although every other day might be a bit much. The food choice we make might feel insignificant at first, but they can add up. This is even true when it comes to the parts of us farthest from our mouths! Diet and foot care may be more related than you expect. 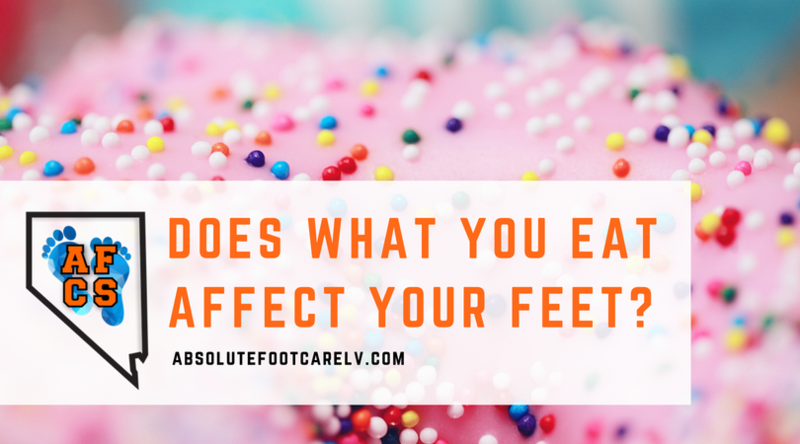 We went a little bit into how food choices can be part of a foot-healthy lifestyle in our previous blog, focusing largely on inflammation. However, nutrition is such a large topic that there is plenty more to go into! So before celebrating National “I Love Food” Day (September 9), consider what the best options for your foot care. For as much that is done externally to make toenails look their best, how often do we consider what we can do to make them strong and clear from the inside out? This is not just a cosmetic matter, either. Our toenails help protect the tissues around our toes from injury and infections. They’re true front-line soldiers! Vitamin B12 – A deficiency in vitamin B12 can lead to brittleness and easy breaking of both toenails and fingernails. Eating a diet including beef, eggs, pork, poultry, and dairy should provide enough of the vitamin. If you are vegetarian or vegan, you might need to find foods fortified with the vitamin, or take a supplement. Zinc and Vitamin C – Both nutrients have antioxidant properties that help protect nail tissues from free radicals. Think of it as shielding from harmful, invisible particles that can lead to white spots and internal damage. Zinc-rich foods include green beans, soybeans, cheese, and pumpkin. Vitamin C-rich foods are the classic oranges, but also red peppers and cooked leafy greens. Biotin – This one is also known as B7, and also helps nails from becoming brittle and weak. Mushrooms, nut butters, beans, and whole grains should contain enough for you, and deficiencies tend to be uncommon. “Milk does a body good,” as they old ads used to say—but there are plenty more sources of calcium for those who don’t prefer it. Leafy green vegetables, salmon, beans, yogurt and almonds also provide it. Calcium’s contribution to bone strength and recovery is important at any age, especially to the feet. While we are young and growing, our bones are building themselves up at a fast pace. Calcium intake builds reserves and may help the recovery process from childhood injuries such as Sever’s disease, which can be a source of heel pain. As we grow older, osteoporosis can slowly develop over time, weakening our bones. Even at this point in life, however, calcium can still help maintain bone strength against stress fractures. When taking calcium, don’t forget Vitamin D as well—it works hand-in-hand with the body to help it absorb the mineral. Cramps in the feet and toes (as well as higher up in the legs), often result from a lack of water, salt, and minerals such as potassium, calcium, and magnesium. This is why cramps tend to be more likely to happen after we’ve given ourselves a workout and sweated a lot of these substances out. Healthy hydration and electrolyte intake can help prevent a show-stopping cramp from hitting your feet. If a deficiency in minerals may be a cause, try almonds for magnesium, bananas for potassium (you see these a lot after running events!) and spinach or broccoli for both! We’ve already covered calcium. We have 33 joints in each foot, so you better believe we’d want to mention them! For those who have joint pain, 1-3 grams of fish oil daily may have an effect on reducing inflammation, stiffness, and swelling. The omega-3 fatty acids present in the oil are also believed to help increase circulation, which is also helpful in increasing recovery and reducing inflammation in the feet. But that’s not all! The healthy fats inherent in fish oil can also build up and provide lubrication to the tissues between joints, minimizing friction and strain. A fish oil supplement can provide what you need (although be prepared to taste it when you burp). Naturally, cold-water fish are good sources of the oil, including salmon, sardines, smelt, and anchovies. While diet can be a sound element in helping maintain good general health, we know it’s not always the only thing you may need. If you have pain, discomfort, or other problems that persist even after trying something new, it’s time to see a professional. Treatments in addition to natural lifestyle changes can make all the difference you need. Schedule an appointment at either of our Las Vegas offices by calling (702) 839-2010. You can also fill out our online form and our staff will get back to you soon.